161-Day Voyage Visits Six Continents and 75 Ports, Including Viking’s First-Ever Call on Hawaii plus 13 overnight stays. Viking's 2020-2021 World Cruise departs December 14, 2020 from Miami and includes 6 new ports of call including an inaugural visit to the Hawaiian islands. You'll explore islands of the Caribbean and the South Pacific; call upon ports in Asia, from Hong Kong to Bangkok; explore countries of the Middle East, including Oman, Jordan, Egypt and Israel; and sail through the Mediterranean before concluding in London. OR choose a shorter, 140-day segment! 2021 Viking World Discoveries departs from Los Angeles January 4, 2021, and visits 27 countries and 66 ports. Every Viking cruise fare includes an outside stateroom, a complimentary shore excursion in each port of call, all onboard meals, and all port charges and government taxes. Guests also enjoy many complimentary amenities as part of their fare, including: beer and wine with lunch and dinner service; alternative restaurant dining; free Wi-Fi; self-service laundry; access to the Thermal Suite in the LivNordic Spa; and 24-hour room service. 2021 Viking World Discoveries starts at $52,995 per person, based on double-occupancy. free luggage shipping services for embarkation. $1,000 per person in shipboard credit which can be used toward optional tours, spa services, onboard shops and beverages. Oahu (Honolulu), Hawaii (NEW): The Heart of Hawaii: Guests can enjoy everything from historic landmarks to world-class shopping on the island of Oahu. Soak up the sun along Waikiki Beach’s pristine beaches or visit Pearl Harbor to see where the tragic events of December 7, 1941 unfolded. Kauai (Nawiliwili), Hawaii (NEW): The Garden Island: Nicknamed Hawaii’s “Garden Island,” guests will explore the lush vegetation and wildflowers of tropical Kauai while in port. Visit the Na Āina Kai Botanical Gardens & Sculpture Park, an infusion of beautiful flora and art and home to one of the largest collections of bronze sculptures in the U.S., or follow the footsteps of Captain James Cook, the British explorer credited with the first recorded European contact with the Hawaiian Islands. Moorea (Opunohu Bay), French Polynesia (NEW): Paradise in the Tropics: This tropical island is famed for its unprecedented beauty and its cuisine is as colorful as its landscape, drawing on influences from both European and Chinese settlers. Guests can take in this idyllic paradise from the water onboard a catamaran or immerse themselves in Polynesian traditions and customs by engaging with locals. Hue (Chan May), Vietnam (NEW): Palaces and Temples: Discover the ancient Imperial City of Hue, a rich repository of palaces and temples and seat of the Nguyen Dynasty for 150 years. Guests can experience the locals’ morning trading activities during a visit to a traditional food market or explore the crumbling stone walls of the citadel, which holds stories of long-fought battles. Sydney, Australia: Iconic Harbor: Guests will sail into Sydney’s magnificent harbor, the world’s largest, and enjoy an overnight stay allowing ample time to explore this culture-rich city. Guests can enjoy an insider’s view of Australia’s world-class opera house or experience the natural wonders of the nearby Blue Mountains. Mumbai, India: A City of Old and New: Formerly Bombay, the bustling city of Mumbai is the financial, commercial and entertainment capital of India. While in port, guests can learn about the iconic activist Gandhi or enjoy the Hanging Gardens, one of the prized few parks found in the city. Istanbul, Turkey: Where East Meets West: An overnight stay in Istanbul gives guests more time to experience this historic city that straddles two continents across the Bosporus Strait. Explore a wealth of religious sites such as the spectacular Blue Mosque or the legendary Hagia Sophia, or sample delicious fusion cuisine, combining fresh Mediterranean fare with spices from the Far East and Asia. 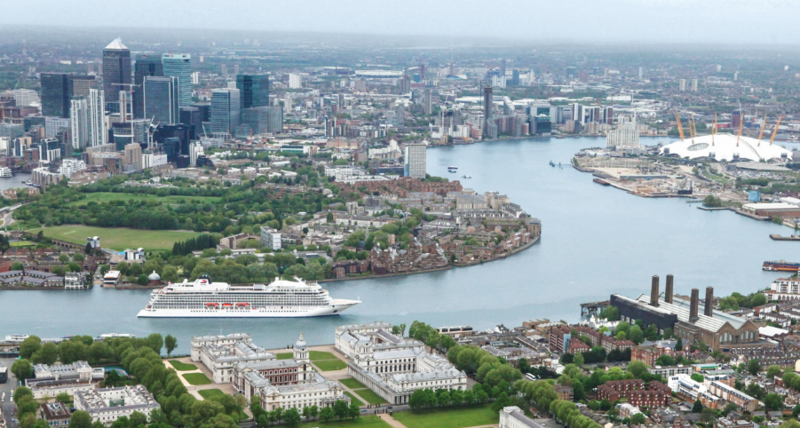 London (Greenwich), England: The Royal Borough: Guests will end their sailing in the historic Royal Borough of Greenwich, London on the Thames River, allowing easy access to the regal capital’s iconic sights, including the Tower of London, Houses of Parliament, Big Ben, Westminster Abbey, Buckingham Palace and St. Paul’s Cathedral. All Veranda Staterooms: Guests can choose from five stateroom categories, starting from 270 sq. ft. Veranda Staterooms, all with private verandas, sweeping views of the destination and premium amenities that include king-size beds with luxury linens, generously proportioned closets, large interactive flat-screen LCD TVs with movies-on-demand, free Wi-Fi and award-winning bathrooms with large showers, premium Freyja® bath products and heated floors. Explorer Suites: The ships feature 14 Explorer Suites, which are two-room suites ranging from 757 to 1,163 sq. ft. With expansive views from wraparound private verandas, as well as the most amenities and privileges of any category on board, Explorer Suites offer the ultimate sanctuary for World Cruise guests. 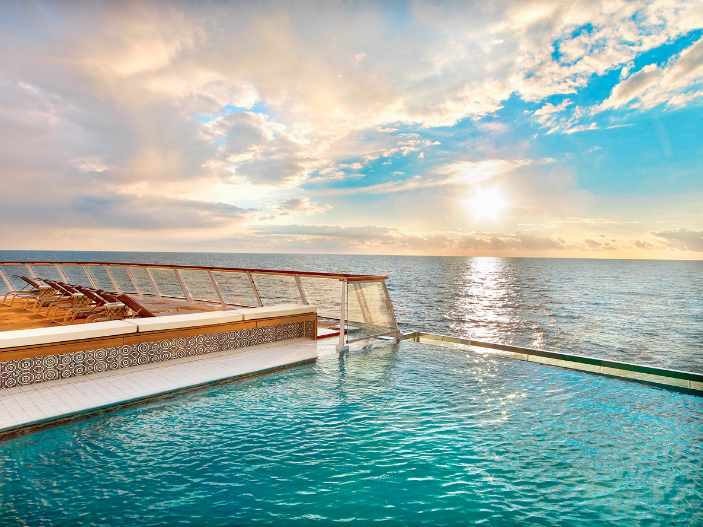 Two Pool Choices: In addition to the Main Pool with a retractable roof permitting any-season swimming, the ships feature a first-of-its-kind glass-backed Infinity Pool cantilevered off the stern, allowing guests to swim surrounded by their destination. Explorers’ Lounge and Mamsen’s: Share a cocktail with friends. Linger over a Norwegian breakfast and a nautical history book. 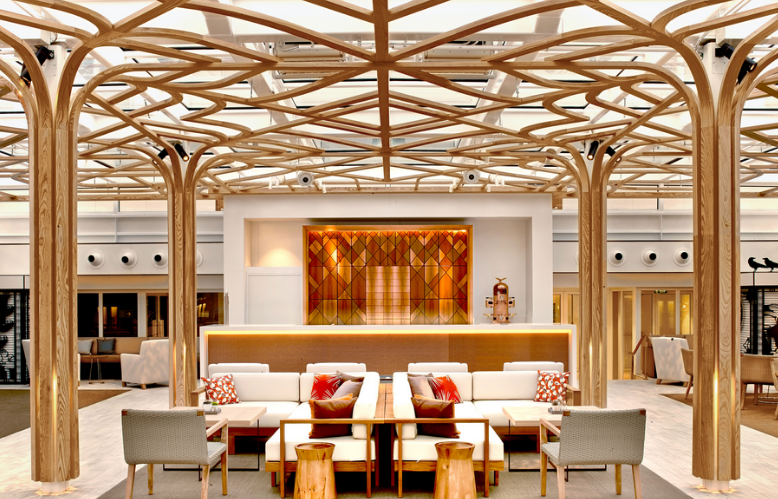 The Explorers’ Lounge and Mamsen’s gourmet deli are thoughtful spaces located at the bow of the ship and designed to represent the Scandinavian spirit for complete relaxation and for marveling at sweeping views through double-height windows. Dining Choices: Viking’s ships offer eight dining options, all with no additional charge or fee—from fine dining in The Restaurant, which serves three full meals and a variety of culinary options, and the World Café, which features international fare and regional specialties including a sushi and seafood cold bar—to intimate alternative dining experiences at The Chef’s Table, which offers a multi-course tasting menu with wine pairings, and Manfredi’s, which features freshly prepared pastas and Italian favorites. The Pool Grill specializes in gourmet burgers, while afternoon tea and scones are available in the Wintergarden. Mamsen’s serves Norwegian deli-style fare, and complimentary 24-hour room service allows all guests to enjoy many signature dishes in the comfort of their stateroom. 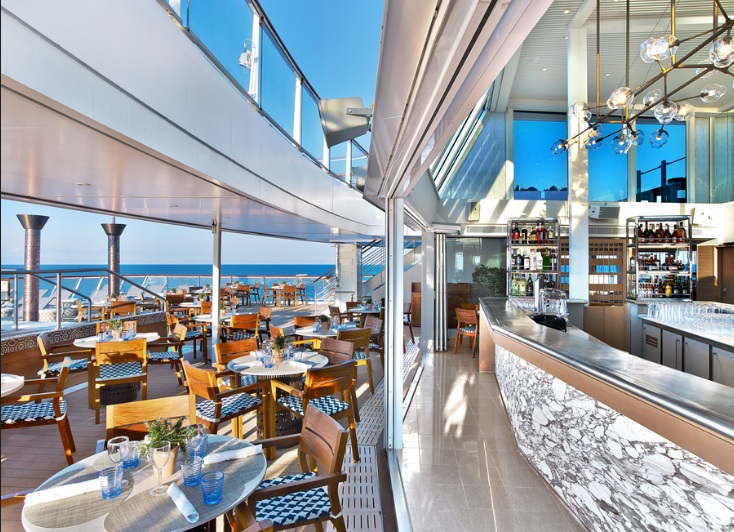 Furthermore, with multiple choices for outdoor seating during meals, Viking’s ocean ships offer the most al fresco dining at sea. Additionally, The Kitchen Table specializes in regional dishes from market to table. Cultural Enrichment: Viking experiences from ship to shore are designed for unparalleled access and cultural enrichment. Viking Resident Historians deliver high-level historical and cultural education specific to the journey, offering invaluable insight in to the rich history of the destination. Guest Lecturers who are experts in their fields shed light on the destination’s art, architecture, music, geopolitics, natural world and more. Destination Performances represent the most iconic cultural performing arts of the region—whether it be Italian opera or Portuguese fado. Resident Classical Musicians—pianists, guitarists, violinists and flautists—perform classical compositions throughout the ships. And Culinary Classes in The Kitchen Table, Viking’s onboard cooking school, focus on regional cuisine. Nordic Inspiration: Even the smallest details take their inspiration from the exploratory spirit of the original Vikings, reflecting deeply held Nordic traditions. Light wood grains, touches of slate and teak, Swedish limestone and fragrant juniper appear throughout the public spaces and Spa. The Clinker-built design of the Viking Bar mirrors the construction style of the original Viking Longships. A Viking Heritage Center provides history and context from the Viking Age. And characters from Norse Mythology are subtly incorporated into the design, providing curious guests with inspiration to further explore Viking’s Nordic heritage. Sustainable Features: Designed to be environmentally friendly, Viking’s ships feature energy-efficient hybrid engines, hydro-dynamically optimized streamlined hull and bow for maximum fuel efficiency and equipment that reduces exhaust pollution and meets the strictest worldwide environmental regulations.